If a customer has specified an email address or a phone number, you can easily send him or her an email or a text (SMS) message; e.g., to request additional details, directly from your Shop-Script backend. To send a message, open the "Orders" screen in Shop-Script backend. Choose the desired transport: email or SMS. Enter your message text and complete the sending. 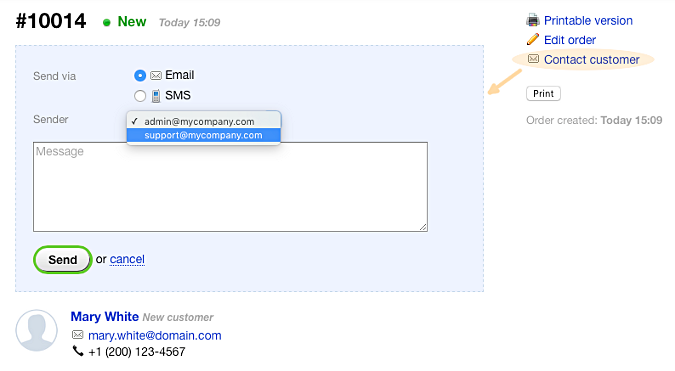 The list of available email senders is defined by all senders specified in the settings of email notifications. View current notification settings in backend section "Settings → Notifications". Read more about setting up email notifications. The SMS option is available only if a customer has specified a phone number in his or her contact information. The list of available SMS senders is defined by your current SMS provider setup in the main "Settings" screen. Read more about setting up integration with an SMS provider.